You can also give Brides as a gift or have it sent to a US address. Deals & Discounts: Receive money-saving offers and special deals from carefully selected sponsors (NOTE: Your email address will NOT be shared with any 3rd party). Sent on Tuesdays and Thursdays. 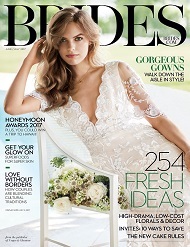 The Insider: Get the scoop on new brides.com features, helpful tools, and be the first to learn about our sweepstakes and contests. Sent on Mondays.